The Republican Potential Presidential Candidates – Who is in, who is out, and who is going to be standing in the end? 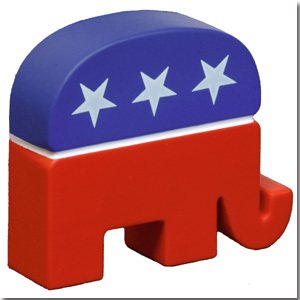 Okay, it’s time for Political Gum Hockey to offer its combined two cents on the Republican presidential field. And we’re sure you’ll agree that it’s worth both of those cents. So who’s in and who’s out? It’s been a busy week, and the next few weeks will be even busier. But essentially we know who will be in the race for the Republican nomination. Donald Trump – Doesn’t matter, since he was just “in” as a really long and obnoxious ad campaign for his reality show. The scary part is that the tea party in droves took him seriously. Which pretty much shows how seriously we should take the tea party. Haley Barbour – After titillating the GOP establishment by visiting Iowa, New Hampshire and South Carolina, Barbour surprised everyone by opting out. He wouldn’t have gotten the nomination anyway, but most thought he would run. Nope. Mike Huckabee – Huckabee decided his heart wasn’t in it and opted out. He may have actually had a shot at the nomination (or, maybe not), but we’ll never know if he would be taken seriously or end up an also-ran. John Thune – A potential rising star and giant killer (he knocked out former minority and majority leader Tom Daschle). Thune rightly decided his time will come…in the future. PGH predicts you’ll see more of Thune, eventually. Mike Pence – Pence wisely realized he has no chance at president, but a heckuva good shot at getting the Governorship of Indiana. This could be important because President Obama barely squeaked out an electoral win in Indiana and Pence being on the ballot might be enough to swing the state the other way. Sarah Palin – Okay, most sentient folks already knew this long ago, but it appears the rest of the tea party and GOP are finally figuring it out. PGH has written about why she won’t run before, so you can just read it there. Okay, that was a short list. Mostly because there are a bunch of people that others are trying to draft into running. They include Jim DeMint (no, really), John Bolton (no, really), Rick Perry, General David Petraeus, Rand Paul, and Chris Christie. All have said repeatedly that they aren’t jumping into the race. The fact that people are still trying to get them into the race tells you something about the people already in the race. Okay, let’s hop to those who have either officially announced they will run for the Republican nomination or will be doing so within the next few weeks. Mitt Romney – By far the front runner for the 2012 nomination, and the heir-apparent for the GOP. As most people know, the Republican party tends to simply anoint the next one in line, and for 2012 that would be Mitt. Unfortunately for Mitt, 2012 may actually be a bad year for “the anointed” as the GOP seeks someone from the promised land. Newt Gingrich – Newt has visualized himself in the President’s throne room Oval Office ever since he was speaker. He thinks that highly of himself, and seems to sometimes forget what is real and what is his own magnificent marketing. PGH has already given the odds of Gingrich getting the nomination, and the last few days have pretty much borne that out big time. Tim Pawlenty – Pawlenty has been running for President for at least the last two years, and still his Q-Factor is epitimized by the phrase “Tim who?” Some actually give him a shot, but PGH thinks he might have to eat his words…the ones where he said he was running for President, not Vice-President. More on Tim in future posts. Ron Paul – PGH has written on Paul already. Paul did well in Iowa last time, but barely registered after that. He could do better this time with tea party support. But he won’t. Gary Johnson – Who? [Okay, I’m not being facetious this time.] Johnson will be out faster than anyone can figure out who he is. Herman Cain – Former pizza magnate and talk radio host made quite a showing in the first non-debate of five unknowns (including Pawlenty). If he does well in future debates it means the front runners aren’t connecting with the primary voters, which means big trouble right here in River City (and everywhere else). Still, he could liven up the place a bit. Good for ratings. Michele Bachmann – Talk about good for ratings. Bachmann is a sought after interview on TV, especially shows that need a bump during sweeps month. Bachmann hasn’t said she’ll run yet, but it’s a pretty good bet she will. Even she knows that she doesn’t have a shot at President, but I betcha she’ll jump at the chance to take the VP job if offered. Ironically, if the electorate picks someone more mainstream there is no chance in that really hot place that the eventual nominee will pick another Palinite for VP. The GOP may be slow, but it ain’t that dumb. Mitch Daniels – The Republican establishment is desperate for Mitch Daniels to jump into the race. That should scare Mitt. Daniel’s will probably run, though it isn’t guaranteed. If he does, he’s a bit of a wild card. Will the tea party like him? Is he too moderate? Can he defund enough social programs in time to get the extremist wing of the Republican party to fall in love with him? Stay tuned for more PGH analysis. Jon Huntsman – Huntsman has it all. He’s good looking, has perfect hair, is Mormon, has executive experience. Accomplished things that the Obama Administration is touting. Wait. Sounds a lot like Mitt Romney? BTW, did you hear the news that Mitt raised more than $10 million dollars in one night? That wasn’t a coincidence. Huntsman is even more of a wild card than Daniels. I suspect PGH will talk more about Huntsman very soon. Ah yes. I guess I did miss some people. Can’t imagine any of them getting very far. Even Roemer isn’t lighting any fires of support.